The Festival of ideas and creativity will once again provoke an open and pluralistic reflection on the transformation of social and economic models, leadership, communication, the freedom of expression in the digital age, bullfighting as a cultural phenomenon, the role of women in Arab revolutions and sustainable architecture, among others. The first part of Hay Festival will take place on Saturday 17th September at the Aula Magna of IE University – the former convent of Santa Cruz la Real. During a discussion called “Two free voices” the journalist Javier Moreno, Director of El País will talk with the German philosopher and influential thinker Rudiger Safransk. This event will be hosted by the President of IE University, Santiago Iñiguez. 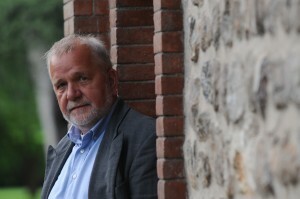 Rüdiger Safranski, German philosopher and writer, member of the German Language and Poetry Academy, talks with Javier Moreno, a correspondent in Berlin in 2003 and director of El Pais since 2006. Presented by Santiago Iñiguez, President of IE University. Simultaneous translation from German into Spanish will be available. The talk is co-organized by the AXA Foundation and with the collaboration of the Goethe-Institut, the German Embassy in Spain, IE University, Matarromera and El Adelantado de Segovia, Caja Segovia Municipality of Segovia, AC/E (Spanish Cultural Action), the Ministry of Culture and Renfe.